I never thought this day would come, but I'm caught up with Supernatural!!!! 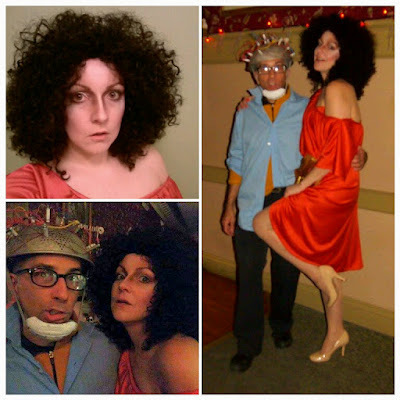 This blog is about season 13. You can read my thoughts on 1&2, 3&4, 5&6, 7&8, 9&10 and 11& 12. The last episode of Season 12 threw us for a loop. A LOT HAPPENED. Crowley sacrificed himself, Kelly died, Castiel (Cas) died and Mary Winchester is in another dimension with Lucifer and Bobby. Kelly's "baby" er son that's a young man ~ Jack ~ is still figuring out his powers. (Duh, of course Kelly dies if she gives birth to a baby the size of a young man!) Reminds me of when Dawn was added to Buffy. At one point early on Jack calls to Cas in the "empty" and he gets sent back to earth. Cas plays other personalities VERY WELL. (Season 13 E4 & E22). He was sent back to earth because he annoyed an ancient cosmic being too much. 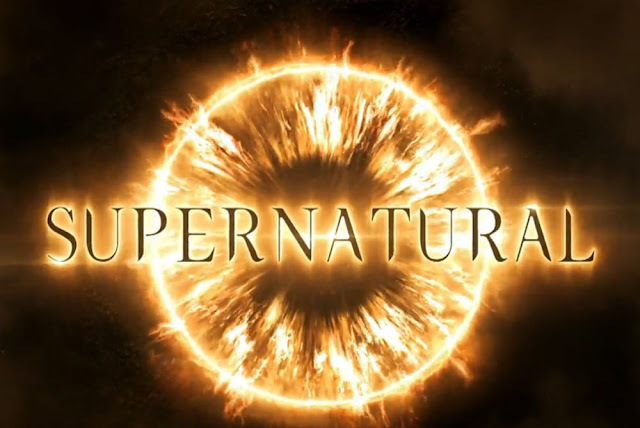 Lucifer is back on earth, has no powers and saves Cas to tell him that Michael the Archangel is coming. Michael and Kevin Tran (remember him?) are in the alternate reality. Ketch survived because of a spell to keep him alive. He's killing witches and starts working with Asmodeus who captures Lucifer and Cas, but they eventually get away. Lucifer takes over heaven, but doesn't know what to do with it. Meanwhile the angels are struggling to keep heaven open since there's only nine angels left. They thought Lucifer could make more but he can't, so they don't want him. Nothing came of this story arch. Hopefully heaven can be saved in Season 14. Jack and Mary at one point are in the alternate reality with Bobby, and Michael wants Jack to open a gate to earth so he can start a war, meanwhile Sam and Dean want Donatello to read from the demon tablet to open a rift to the other dimension. Cas turns Donatello into a vegetable, so he's in a coma now? to get into his mind and find out the ingredients to open the hole to the other dimension and stop the war. Dean and Ketch enter the alternate world together to save Mary and Jack. In addition to Mary and Bobby there, the other Charlie is there too! Ketch ends up staying there and working with Charlie while Dean goes back to our earth hatch a plan. Gabriel (Gabe) the Archangel (remember him too?) aka trickster or class clown is captured by Asmodeus for his grace, but Gabe eventually kills him, then Gabe is killed by Michael in the alternate world. But is he really dead? Gabe is such a likeable character! I hope he comes back. How can you not like Gabriel? Just look at his shirt. PLUS- Season 13, Episode 5 "Advanced Thanatology". Who urban explores at night in an abandoned mental institution without Ghost Facers? The doctor who inhabited the building wore a plague doctor mask~ that's random, BUT those masks are creepy as hell. Dean ends up killing himself to talk to the ghosts inhabiting the house and sees that Billie the Reaper is now Billie Death. 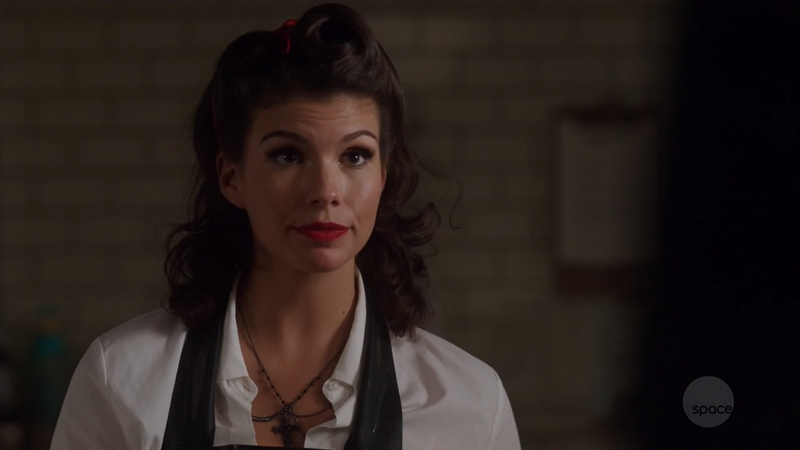 She took after Death's job after Dean killed him. She tells Dean that she's sending him back because he and Sam have "work to do". Just look at those victory rolls and red lipstick. PLUS- Season 13, Episode 9 "The Bad Place" Jack is using dreamwalkers to try and get to the other dimension that Mary is in. The dreamwalker Kaia gets Jack to Mary in the other dimension, but Sam and Dean are transported to a Jurassic Park type world where they are food for a giant monster. 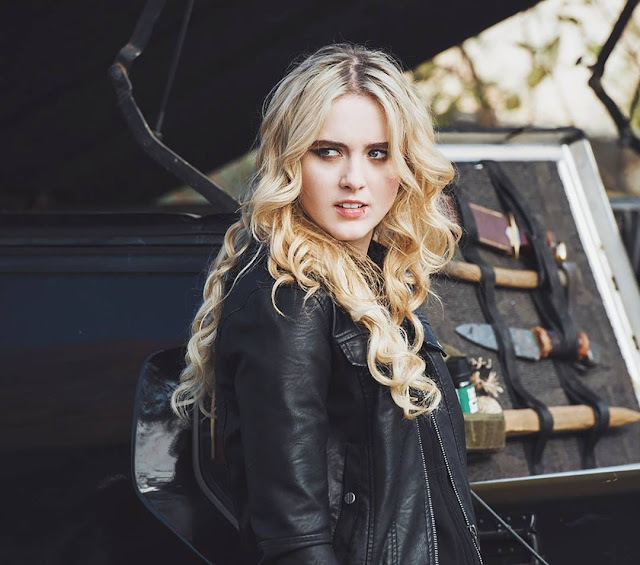 PLUS- Season 13, Episode 10 "Wayward Sisters"When Jody can't find Sam and Dean she gathers her girls ~ Claire the hunter (she has amazing hair), Patience the psychic, Alex a reluctant hunter, Kaia the dreamwalker, and Donna an ex police officer and hunter!!! I love Donna, You may remember her from Season 9 as "fat sucker Donna" she's awesome. They find Sam and Dean in the other world and Kaia gets killed there saving Claire. In the meantime, the portal stays open and a Darth Vader like person comes to earth. It's Kaia from the bad dimension. We never see the result of her coming to earth in this season. Maybe they will pick up the storyline later? Claire & her full and bouncy hair. PLUS- Season 13, Episode 11 "Breakdown" is excellent. It's set up like a 1970s slasher film. Donna's niece is abducted for her body parts that get sold to monsters in an online auction. It might be stylized like the 1970s, but the story is very modern. PLUS-Season 13, Episode 12 "Various & Sundry Villians" Rowena is back and looking for the Black Grimoire, in the end Sam gives her the page she needs to break a binding spell on herself. PLUS- Season 13, Episode 14 "Good Intentions" Mary and Jack find Bobby! Also Dean says, "If bacon is what kills me, then I win." I'm going to use this line in my everyday life. I'm with you Dean. I'd be a vegetarian if it wasn't for bacon and chicken fingers. True story. 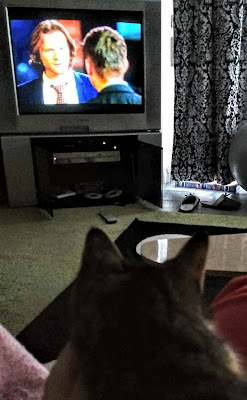 PLUS- Season 13, Episode 15 "A Most Holy Man" Sam and Dean get involved with the mob, but the important thing is the mob boss has a fluffy kitty. This episode is VERY film noir and I feel like it should have been filmed in black and white with all the shadows and dark alleys. PLUS-Season 13, Episode 19 "Funeralia" We see a softer side of Rowena. She talks to the reaper Billie about getting her son Crowley back. She won't bring him back. Rowena and Gabriel are on board to help in apocalypse world. PLUS- Season 13, Episode 21 "Beat the Devil". Sam, Dean, Cas, and Gabriel are in the alternate world. Sam dies by the hand of vampires and Lucifer saves him. You know he wasn't going to die, because that's too easy. PLUS-Season 13, Episode 22 "Exodus". Lucifer and Gabriel are really fun characters and play off each other well. Lucifer gets left behind in apocalypse world to fight Michael, but they end up making a deal instead. Everyone returns to our earth, Bobby, Mary, Charlie, Ketch, Jack, and more. PLUS-Season 13, Episode 23 "Let the Good Times Roll". Everyone is back, but nothing has ended. 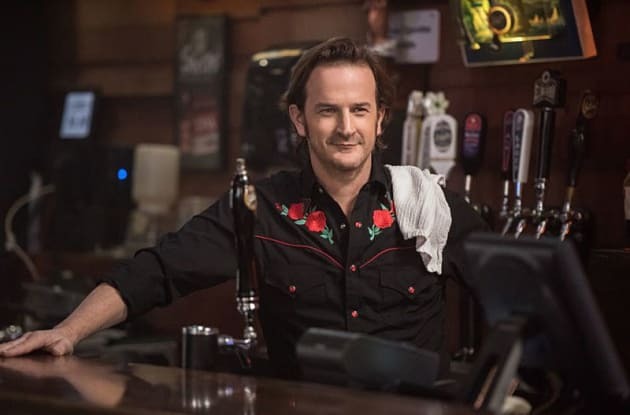 Rowena and Charlie become friends, Jack works with Cas, Sam, and Dean hunting, Ketch went off on his own as usual, and Bobby and Mary become good friends. Everything is happy until Michael and Lucifer show up. Michael tried to kill Sam, Dean, and Cas, but Jack swoops in and saves them. In the meantime, Lucifer transports Sam and Jack to a church? and steals Jack's power. Dean decides the only way to save them is to become "Michael's sword" like he was supposed to do many seasons ago, but didn't want to. Michael takes over Dean's body and fights with Lucifer while flying through the air. It look super hokey. Then Michael kills Lucifer and completely takes over Dean's body and leaves everyone. We end on Dean looking like an extra from Peaky Blinders. PLUS & MINUS- Season 13, Episode 16 "Scoobynatural" Sam, Dean, and Cas enter a Scooby Doo episode. Dean is a creeper in this one, but if he was a cartoon written in the 60s you probably wouldn't notice how offensive it is. 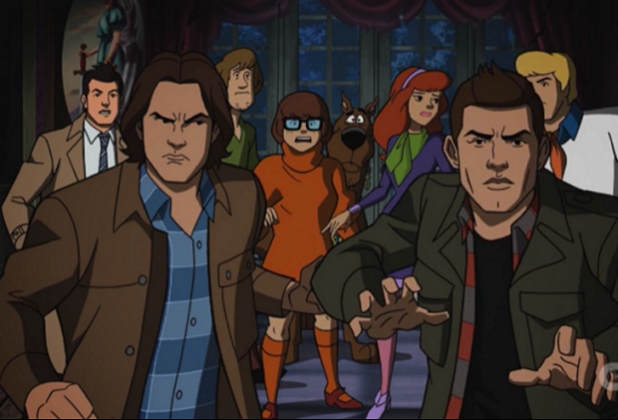 Cas, Sam, & Dean in Scoobynatural. PLUS & MINUS-Season 13, Episode 17 "The Thing", we get to see other chapter houses of The Men of Letters. 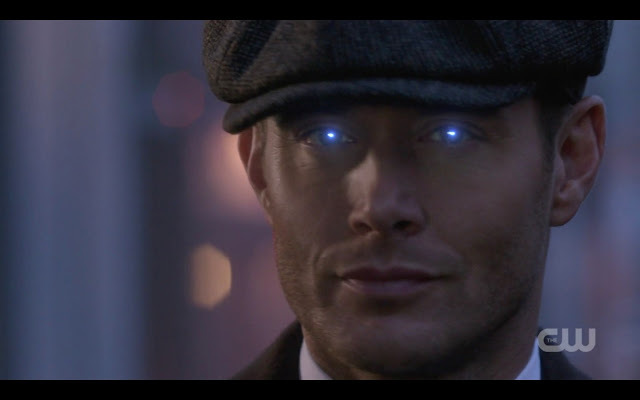 Dean references the "key master" and "gate keeper", that Ghostbusters reference wasn't lost on me. They always assume the girl is a damsel in distress. When will they learn that women can take care of themselves (i.e. their mom) and that they can be evil. I'm no stranger to the Ghostbusters reference. Halloween 2016. MINUS- I feel like Season 13, episode 2 "The Rising Son" is a filler episode. Sam and Dean are trying to figure out if Jack is really evil. While Lucifer is trapped in another dimension his demon Asmodeus takes over Hell. Donatello the prophet warms Sam and Dean that they can't protect Jack. I'm caught up!!! Ginger is sad about that. She could watch Sam everyday. Ginger & Sam FURever!